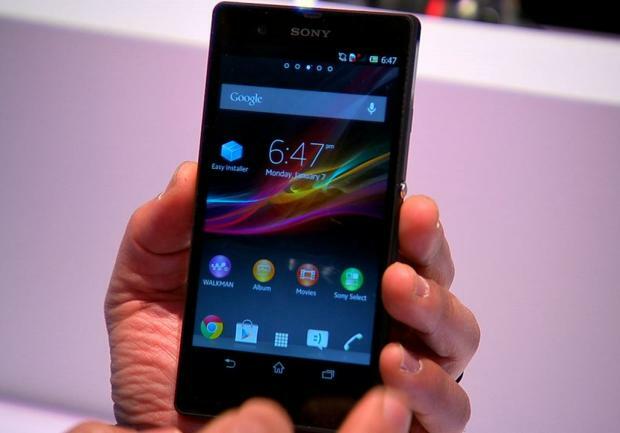 It’s been leaked and rumored over the past several weeks, but today the Sony Xperia Z is official. At its CES 2013 press conference this afternoon, the company announced a new flagship smartphone with large, high-resolution display. The Xperia Z packs a 5-inch 1080p Full HD Reality display, and runs Qualcomm’s latest Snapdragon S4 Pro CPU with 2GB of RAM. Sony’s given the Xperia Z an angular and blocky sort of shape that might be disliked, but will certainly make the phone stand out from the pack. The Z also sports a glass back similar to that of a Nexus 4, which gives it a sleek and classy look (even if it does add create a fragile sense). Perhaps the most interesting and unusual feature of the Xperia Z is its water-resistant construction: Sony claims the phone can withstand being submerged in a meter of water for as much as 30 minutes at a time. It also utilizes a special “wet finger tracking technology” that lets the screen recognize input even when it’s wet. Realistically speaking, I’m not sure how many people actually need that in a smartphone, but it sure is a memorable quality that’s practically made for marketing. To shoot images, the handset features a 13-megapixel camera with a backside illuminated sensor. That means the camera app has a useful HDR mode to take still shots under low-light conditions. One interesting twist is that Sony claims the Xperia Z can also enable its HDR mode while capturing video, the first smartphone I’ve heard of that can do this. Other camera features include a burst mode, panorama, plus a bevy of special filters and effects. Since this is a global handset, the Xperia Z operates on GSM networks but should connect to 3.5/4G HSPA+ infrastructure for quick data access. The Xperia’s high-capacity 2,700mAh battery is not removable, but the device does have a microSD slot to add additional memory. Overall, I am surprised by Sony’s ability to put out a flagship device that light’s up my eyes. Hopefully it’s as good in reality as it is on paper. I am an avid web designer and technology compelled me into journalism. My career started out with a blog about how to hack your Windows PC, but it developed into my love for Apple (which is now nonexistent). Before I was introduced to Android I was an Apple fanboy, I loved anything apple, iPhones, iPods, Macs, etc. Then, I was in Best Buy with a friend and he was buying a phone... An Android phone running Cupcake (1.6). He wasn't the techiest friend a guy could have, but he still loved technology. Now, this was a new phone at the time and of course, he had to get it. I thought the phone was going to be a ripoff of an iPhone but, soon I realized that it had potential. That's how my Android love developed. I currently own a Samsung Galaxy S2 from Sprint as well as an HTC Thunderbolt for Verizon.